challenge was to remove some of the lines. Here is the first zendala completed on the original template. 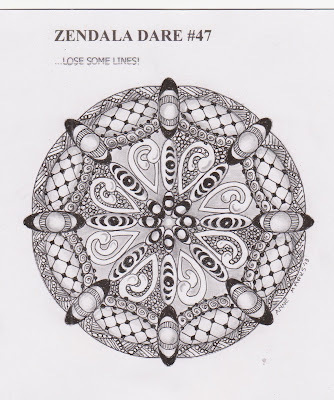 After I had removed the ovals and placed lines across the circle, I was tempted to do a tertiary colour wheel! I finished this off today. Both are sooooo beautiful! The first one is very elegant, I like that. The second one gas beautiful colors and I love the way you can look trough the ovals. 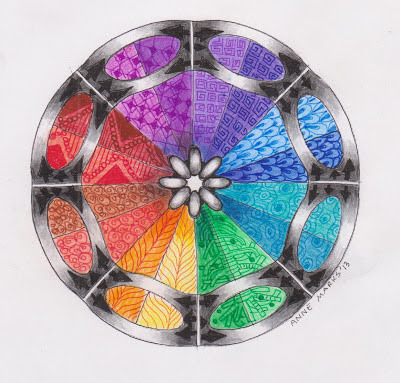 Your color wheel is beautiful! The color wheel is fantastic and I love the way the gray circle is a window through to the back!